Last month, I got my first puzzle from Kadon, the Trifolia - You can read its review here. 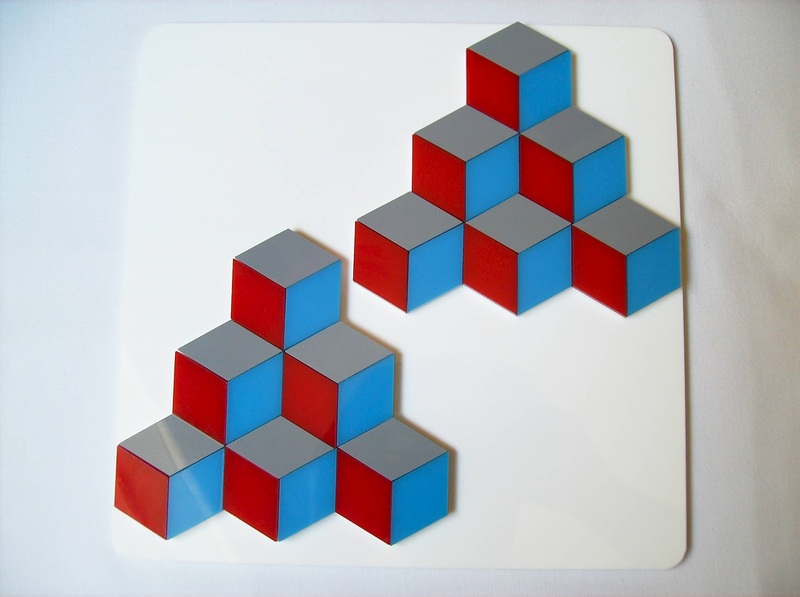 Suffice it to say, I loved the puzzle so much that I immediately fell in love with their line of fantastic acrylic puzzles. A month later, I got my second Kadon puzzle, the Cubits, and to summarize it in one word - Brilliant! 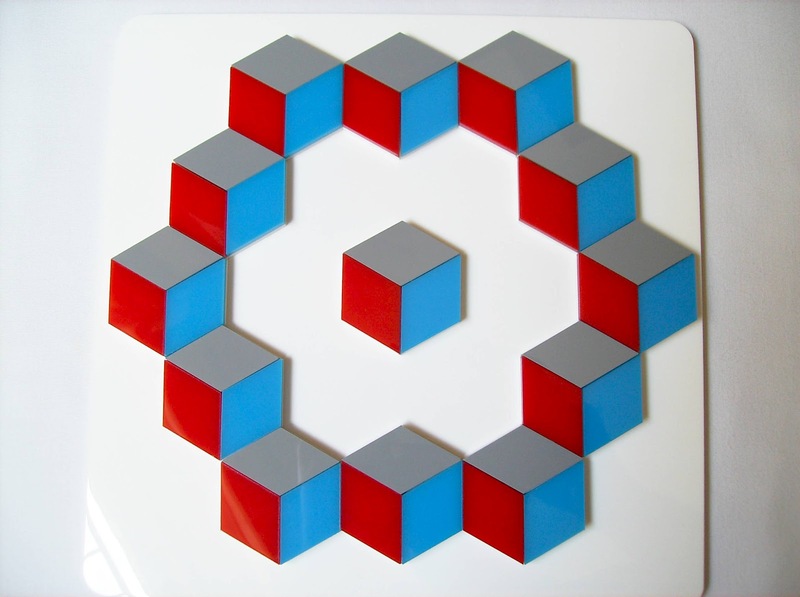 To be more specific, the Cubits is a wonderful and fascinating puzzle which transforms ordinary 2D pieces into mesmerizing 3D shapes and patterns. 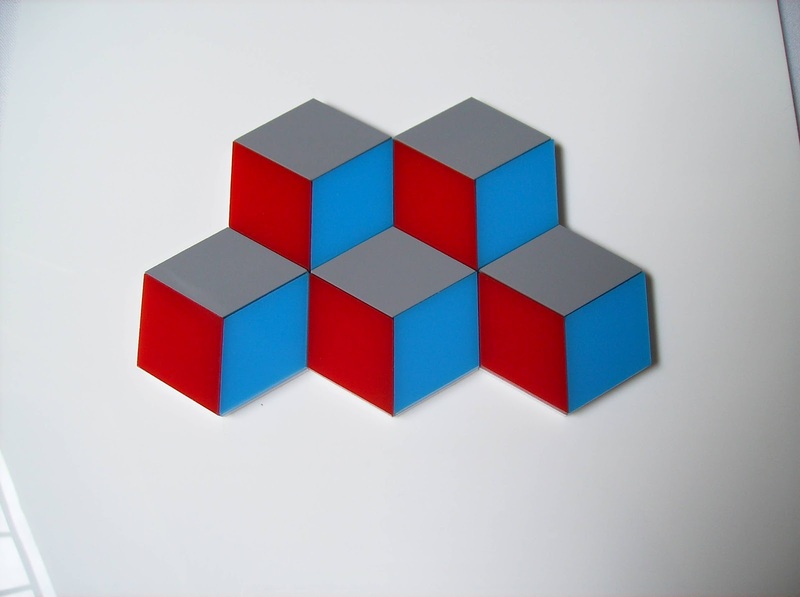 Invented by Anneke Treep and Christian Freeling, the Cubits puzzle was first produced by Binary Arts (now known as ThinkFun since 2003) in 1994. 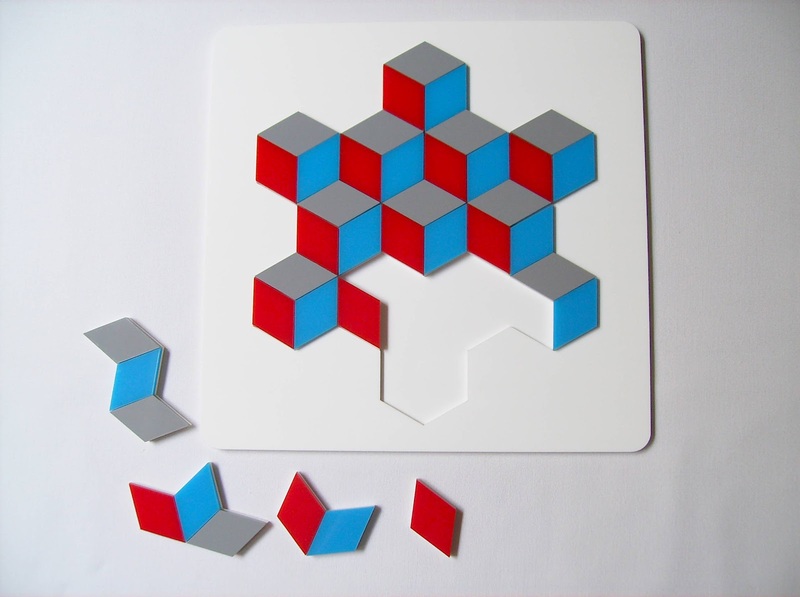 Back then, the puzzle was manufactured only in cardboard, which for a puzzle of this nature doesn't do it justice, at all. 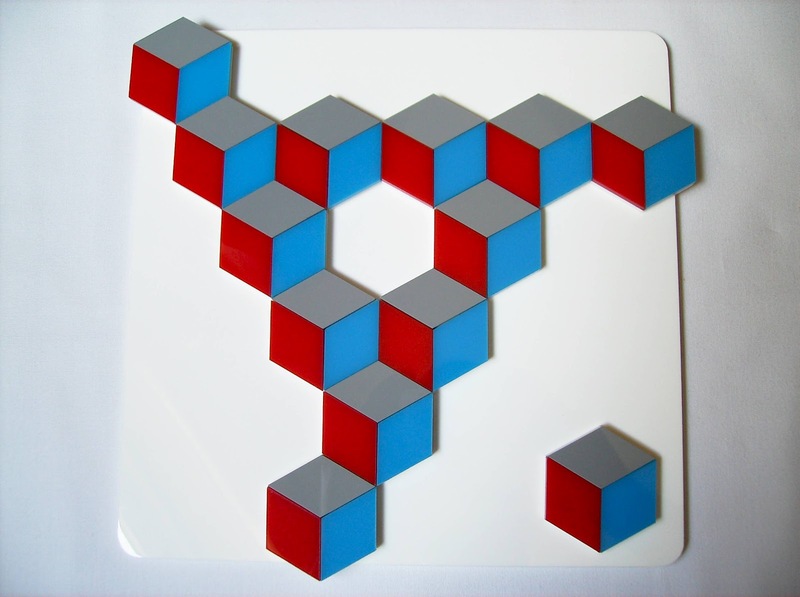 Now, thanks to Kate Jones, the puzzle returned in its full glory with a stunning acrylic set. The tiles are precision laser-cut with three different colors, handfitted and then inlaid to form 16 pieces in six different types. 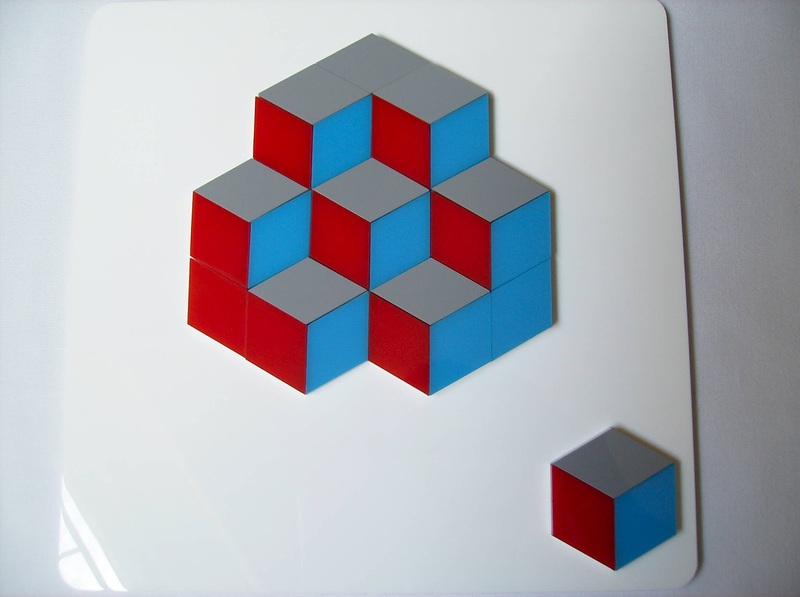 Along with the puzzle is also included a beautiful 21.6cm2 (8.5") white tray, also in acrylic - It may not be noticeable in the pictures, but the acrylic used is so shiny and smooth, it's a joy to play with, and aesthetically speaking, it's like looking at a marvelous piece of art. 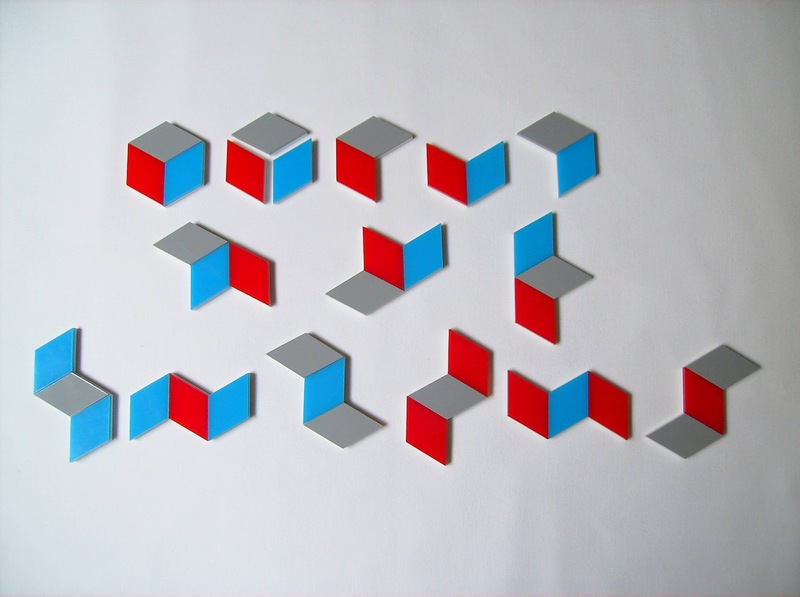 The 16 pieces, in groups of one, two and three, are formed of 39 rhombi at different angles, which provide a cascading of cubes and create the illusion of looking at a 3D object. 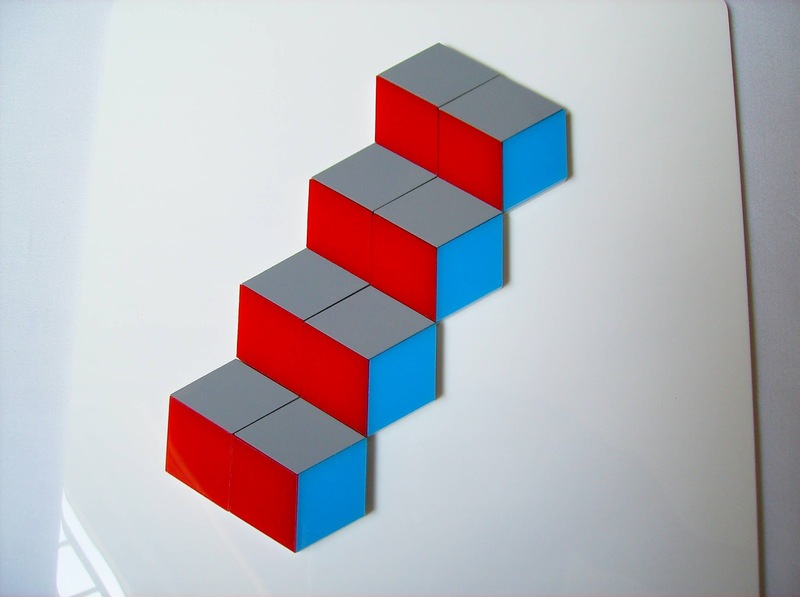 Here, the three different colors play a very important role in making the illusion work. To do that, each color has to be placed at the exact same angle at all times. As you can see from my pictures, grey is always at the top, red at the left and blue at the right. However, the colors don't necessarily have to be in this orientation - You can choose other color configurations and the illusion will still work, as long as you account the same angle for each color. 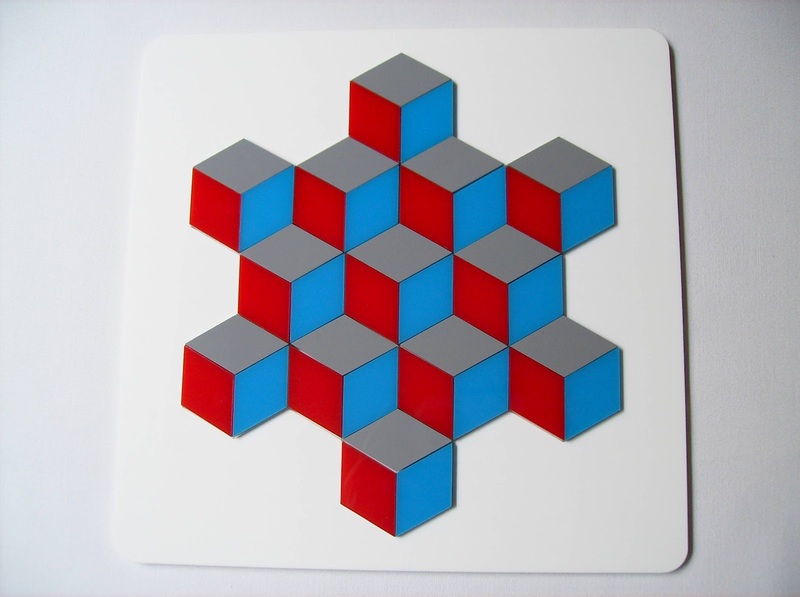 Unlike Trifolia's tiles, the Cubits' are not double-sided, so you can't flip them and change the orientation. As with most of Kadon's puzzles, you get a comprehensive booklet with dozens of challenges to solve, ranging from beginner to expert. 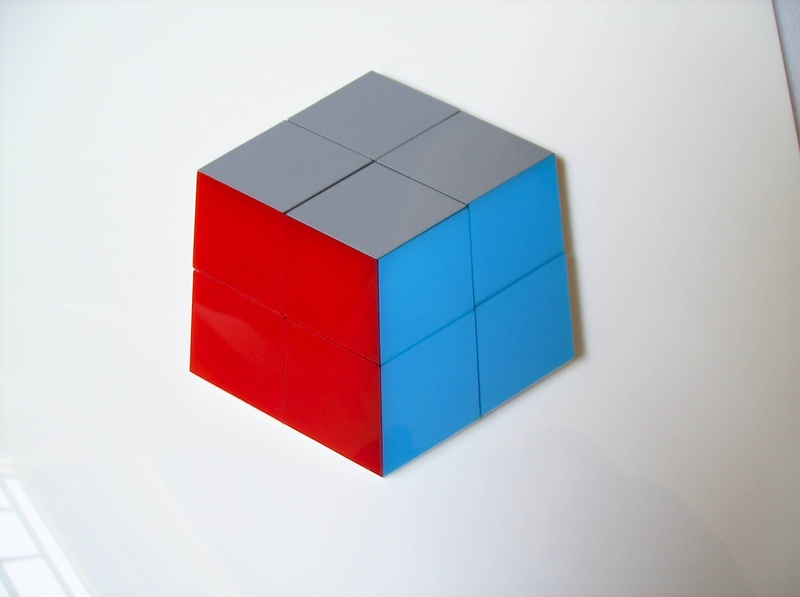 For the Cubits puzzle, the included booklet contains over 100 challenges divided into several categories. I will cover some of them with examples, but I won't be showing solutions for them, as I think it'll be much more satisfying to solve them on your own. The fun doesn't have to stop when you solve all the challenges, though. You can still create your own patterns and shapes with thousands of possible arrangements. 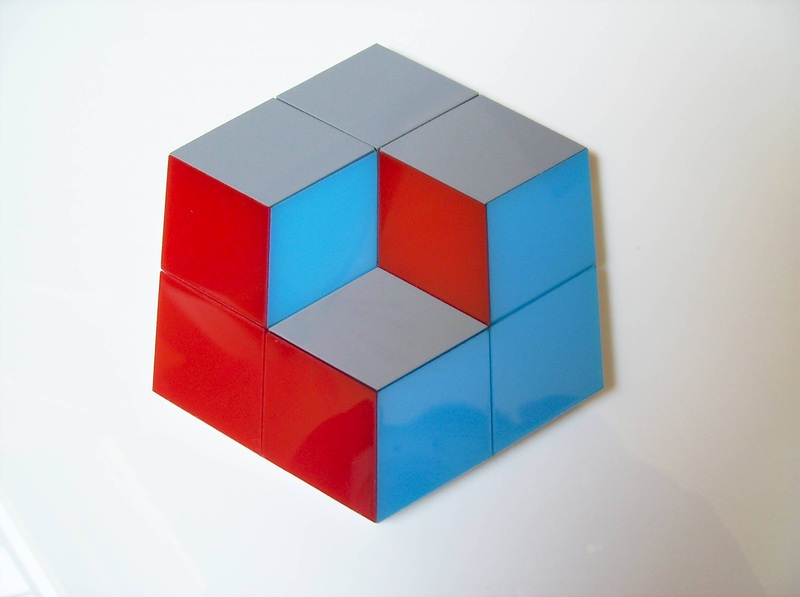 To exemplify how the pieces connect and form these beautiful patterns, take a look at the cube shape below and how the pieces are arranged. Next, see how a small change in the center piece completely alters the perspective. Next, you can see some simple shapes that use only part of the 16 pieces. It's recommended to start with these before attempting to solve tougher challenges, to get a good feel for how the pieces are joined together in different ways. 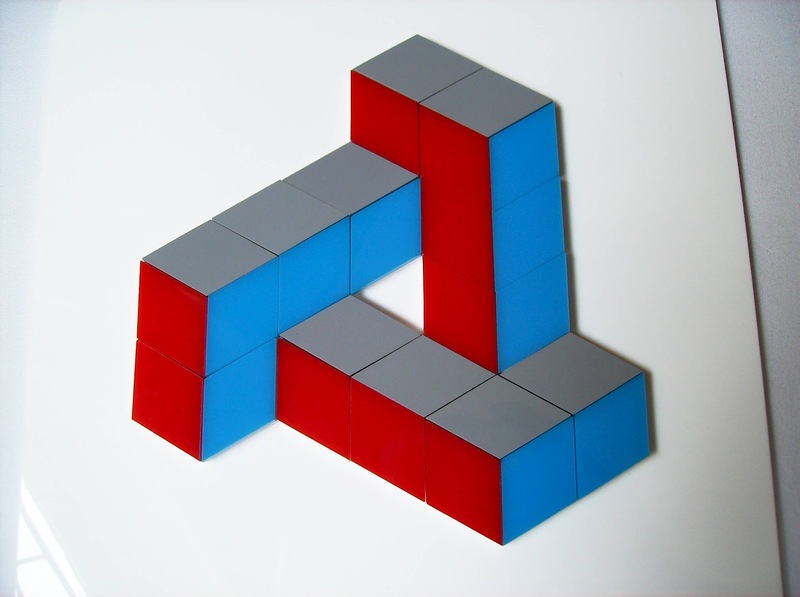 One of the coolest things about the Cubits is building Impossible Objects. You might already be familiar with many of M.C. Escher's images that took advantage of this fascinating visual trick. Below are two of such examples. Another neat way of playing with the Cubits tiles is to form the letters of the alphabet or the numbers from 0 to 9. It's quite a difficult challenge and some letters are actually harder than others to solve. 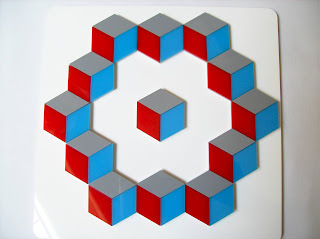 In this type of challenge, you have to use all 16 pieces to form 13 cubes. Below are the letters K-A-D-O-N, the puzzle's publisher and producer. 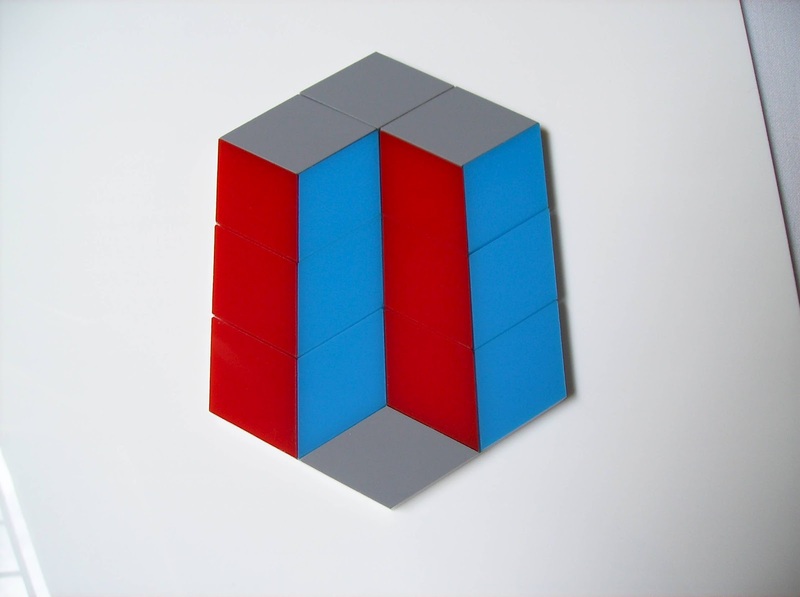 These next examples need all but one piece, the single-cube tile or if you prefer, leave out the three single diamond pieces. Personally, I think it's easier to use the single diamonds and leave out the single-cube piece instead. ... And last, but not least, I leave you with an example of the Replications and duplications challenge. 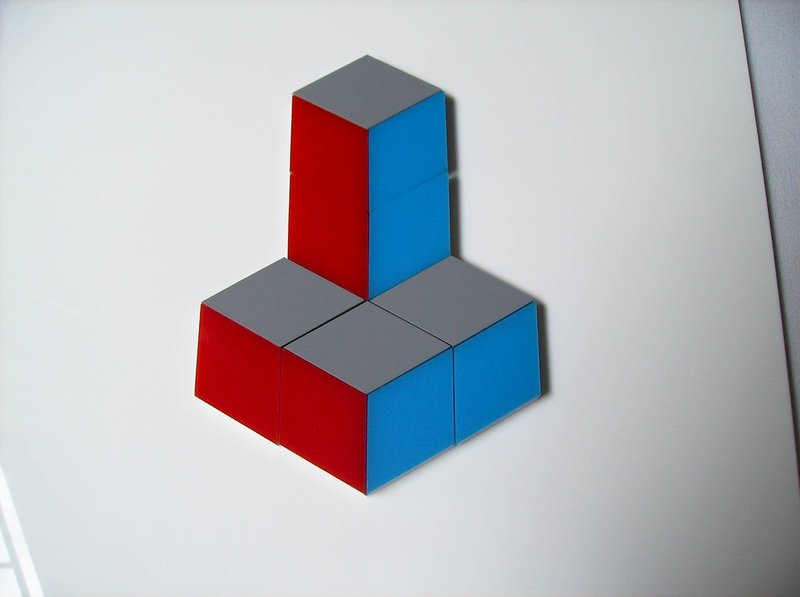 Here, you also need to omit the single-cube tile and use all the other pieces to form identical shapes. Most of them can be really tricky. There are a few more different challenges to attempt in the booklet with a couple of games for 2 or 3 players as well, but I think for now, you can get a pretty good idea of how versatile the Cubits can be. It's up to your own imagination and creativity what you can build. The Cubits might be one of the coolest puzzles I've had the pleasure to play and write about, so far. 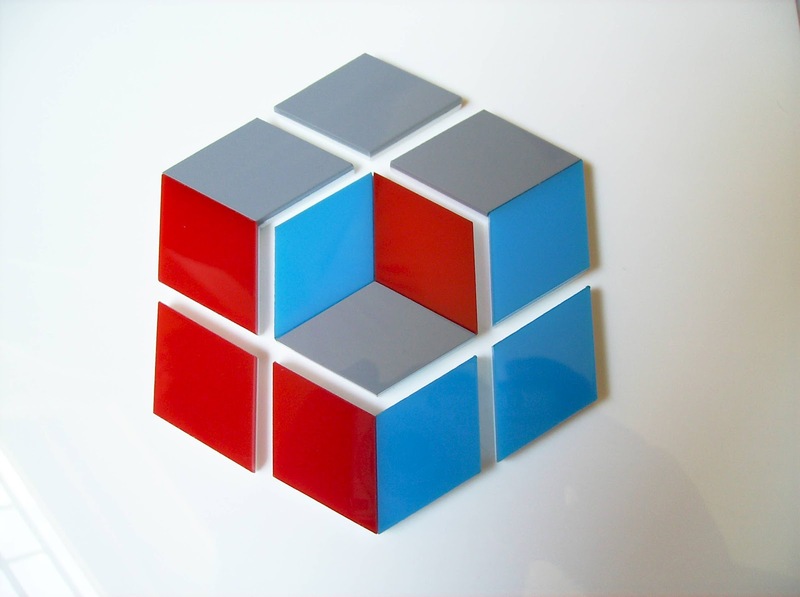 From the outstanding flawless presentation to the extremely fun and engaging challenges, the Cubits is a puzzle that can be enjoyed by anyone passionate about puzzles. 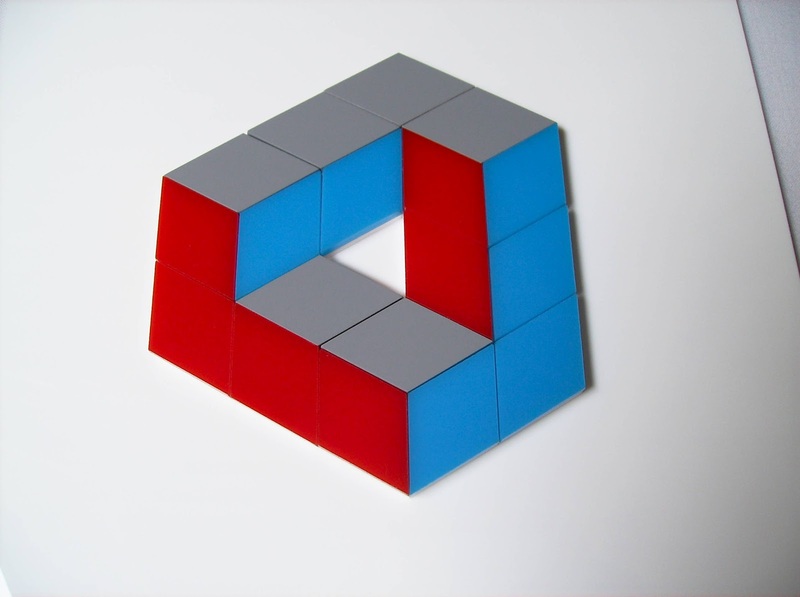 While it may not be a cheap puzzle by any means, the Cubits is worth every single penny and more, for its 100+ challenges will keep you busy for weeks or even months to come. Definitely a puzzle to include in my next top 10, when I reach the 300th post... Unless I review 10 more out-of-this-world puzzles, which I highly doubt. Yes, it's that good. Availability: The Cubits can be found only at Kadon's Gamepuzzles and you can purchase a copy for $55 (ships worldwide - not included in the price).